We are a leading Wholesale Trader of swing steel dustbin, emergency stop button arrow labels, colored magnetic strips, shadow board tool tape, aluminum cylinder storage and acid and corrosive chemical storage cabinet from Mumbai, India. 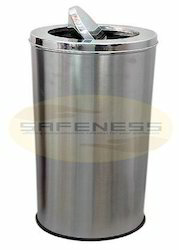 We offer a high-quality range of Swing Steel Dustbins. Because of the top lid, it can be used in the kitchen, office or commercial space, for both organic and inorganic waste. Top Swing on Dustbin is made of Stainless Steel with the self-closing mechanism. This label is used to point arrow exactly at the area where there is a potential danger.This two-part arrow label has a detachable arrow along with it. Label reads EMERGENCY STOP BUTTON. Available in two options self-adhesive tag and Super-Stik backed type of tag. Super-Stik labels are ideal for wood, textured surfaces and other hard to label substrates. Color White, yellow, red, green, blue, or orange. 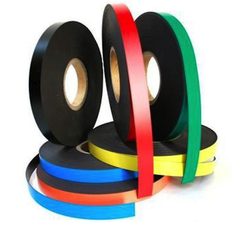 Colored Magnetic Strips are used for the easy identification of products and inventory stored in a warehouse.It is also called as a pre-cut magnetic strip. The write-on surface allows you to write your own message or apply other labels. Easily transferable to bin locations that change frequently. We are offering Shadow Board Tool Tape to our clients. Shadow Board Tool Tape is used to create the shadows of tools to the exact match in terms of size and shapes as that of the original. It is easy to use as you can simply place tool or object over a durable vinyl tape, trace, cut and apply to workplace surface. We are offering Aluminum Cylinder Storage to our clients. Vertical Aluminum Cylinder Storage has a good capacity for the storage in a vertical position. The locker provides secure and a durable storage for the multiple cylinders. 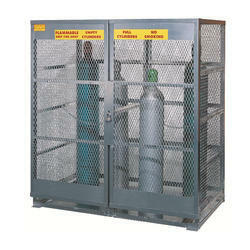 provide non-rusting, durable gas cylinder storage. 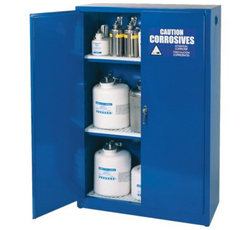 Size (length x Width) 22-1/2"
These are specially designed cabinets for the storage of acids and corrosive chemicals. The internal and external surface is treated with corrosion-resistant powder to ensure its durability. The cabinet is designed in accordance with OSHA and NFPA codes. They can sustain the harshest conditions. It has a unique feature of polyethene trays which fits over shelves to contain small spills. Available in self-closing or manual closing door styles. 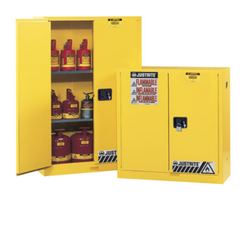 Slimline safety cabinets are designed to occupy the small space and provide the benefit of a full-size storage cabinet. It is highly useful for the storage place where space is a constraint. Compact, 22-gallon capacity unit is perfect for tight spaces, where workspace is at a premium. 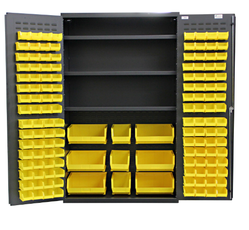 Slimline safety cabinets turn tight quarters into storage space. 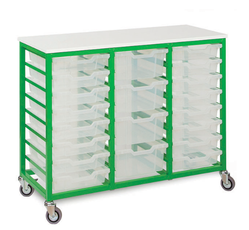 This is a special type of bin cabinet that is used to store and protect parts and tools. It consists of 3 adjustable sleeves and flush-door style bin cabinet. 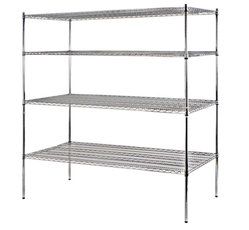 Heavy-Duty Chrome Wire Shelving is specially designed for the warehouses where heavy materials are to be stored. Leveling legs support each corner on stationary storage units. Units feature split-sleeve connectors with grooved, numbered posts for easy assembly. Design Double doors secure along the sides for safe, hassle-free access. Mobile Storage Units is constructed using open wire for ease in visibility and monitoring of the stored inventory. It protects your valuables from theft, loss & mishandling. The door handles are ergonomically designed to make door opening simple and comfortable. Double doors secure along the sides for safe, hassle-free access. Easily adjustable shelves quickly adapt to your changing storage demands. Anti-Fatigue Floor Mats are designed to drain water and prevent slips and falls. 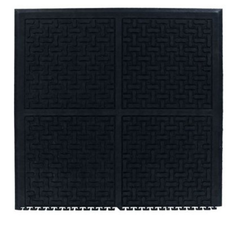 Safety-step â¢ anti-fatigue wet & dry mats have multi-nib backing that provides aeration and anti-fatigue quality. It has a built-in connectors lock with 3 ft.h x 3 ft.w x 9/16" thick mats together for secure footing. Feature Strong and does not crack, tear, or ripple at the borders. Hog Heaven Anti-Fatigue Mats are made of a textured, 100% nitrile rubber surface for superior chemical and slip resistance. It offer the best features for high performance and satisfaction. 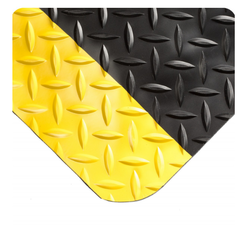 Hog Heaven anti-fatigue floor mats are available in your choice of black border or black and yellow striped border. 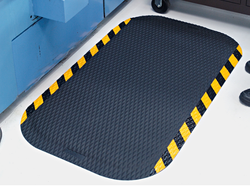 Mats provide hours of comfort for extended use, and are static-dissipative for added safety. It is strong and does not crack, tear, or ripple at the borders. Pressure wash or hose off for cleaning. Size 3 ft. x 12 ft. These anti-fatigue mats provide is designed thick to provide ultimate comfort and resilience. Thick, Zedlan foam base is fused to a vinyl, diamond-plate surface, allowing extended use and extreme durability. 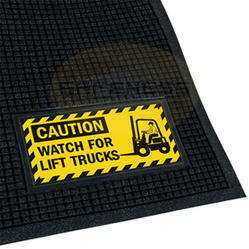 These mats are ideal for use in dry, medium- to heavy-duty areas. 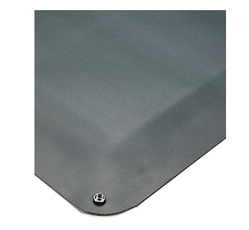 Diamond-Plate SpongeCote® Mat is heavy duty mats, designed for the multiple shift operations. 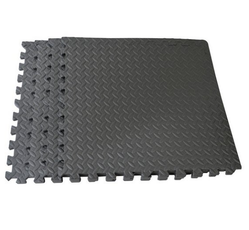 Made for comfort and optimized for worker productivity, these anti-fatigue mats have strength. 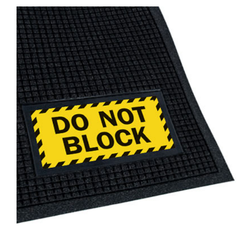 Product Features - Hog Heaven™ Safety Message Anti-Fatigue Mats - Caution Shut Off Power. 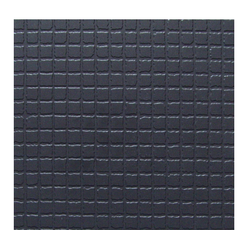 These are highly durable anti-fatigue mats which provide both safety and comfort. They are chemically resistant to grease and oil proof quality. Made of closed cell Nitrile blended cushion that is moulded permanently to the Nitrile rubber top surface. Static dissipative and certified slip resistant by National Floor Safety Institute. 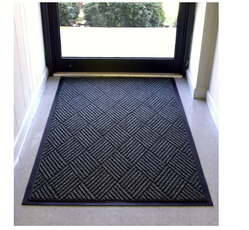 It comes with the tapered border that provides the safe transition from mat to the floor. Scraper Mats are placed in high traffic area where a message with scraper capability is needed. They are made out of 100% UV-resistant polypropylene fabric. The thickness of the Waterhog™ mats is 3/8" . Features an earth-friendly moulded rubber backing consisting of 20% post-consumer recycled content and which effectively resists curling and cracking in all types of weather. Anti-slip tiles are made to catch dirt,dust and other particles that can later be easily removed with a vacuum It consists of a small ¼” holes in 12"-square tile. Use tiles together with trim and corner units to form the area you want. Ideal for safely covering wet or dangerous areas and perfect for scraper mats, too. They are easy-on-your feet and the vinyl construction is resistant to shocks and most sharp products. Feature Unparalleled comfort, resilience and long-term performance, dramatically reducing fatigue. 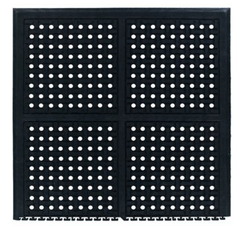 Electrically Conductive Anti-Fatigue Mat is used as safety mats while working with electrical equipment. Protects sensitive equipment and products from damage. It also prevents the incidence of sparts caused by static. Modular anti-fatigue mats help us to strategically place relief solutions in the workplace for the workers' convenience. Hog Heaven™ II Modular Tile Anti Fatigue Mats are made with high-quality closed-cell Nitrile rubber cushion that will not curl or crack even in long-term use. Mats are also electrically conductive, static-dissipative and welding-safe. 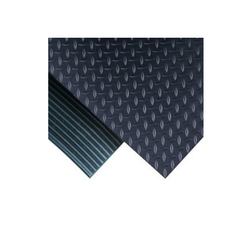 Available with an all black border or with yellow stripes for improved visibility. 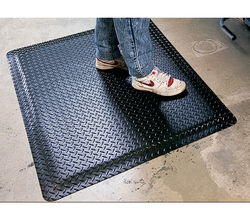 3/4"-thick modular mats are certified anti-slip by the National Floor Safety Institute. Ideal for distribution, manufacturing and retail facilities for picking lines, assembly lines, workstations, check-out stations and more. Usage Used to protect the workers from high voltage shocks. Non-Conductive Floor Mats or switchboard matting are used to protect the workers from high voltage shocks. They provide advanced safety by insulating 30,000 volt. The size of non-Conductive Floor mat is 2 ft. x 75 ft. Available in 2 styles: corrugated switchboard with rib-toothed surface for abrasion resistance and hassle-free cleaning, or diamond plate that will not collect contaminants and cleans easily. 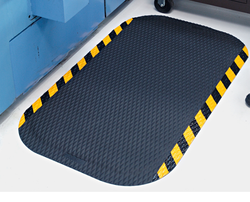 Anti Fatigue Floor Mats are control static and are ideal for commercial and manufacturing areas. It prevents static in dry areas. Nitricell sponge base alleviates fatigue during extended use. The embedded metal scrim ensures effective dissipation. The mat must be grounded for safe use; grounding snap attaches to the lower left corner of each mat. Grounding cord are available separately. Waterhog™ Scraper/Wiper Sign Mats are highly useful to display a message in high traffic areas. These mats are made out of 100% UV-resistant polypropylene fabric and with moulded rubber backing made out of 20% post-consumer recycled content. Scraper mat's sign is made out of polymeric material and moulded to the rubber. Earth-friendly backing does not curl or crack in all types of weather. Waterhog™ entrance mats are available in contemperory style for indoor usage.They are high performance mats with good durability. Rubber-enforced face nub prevent pile from looking worn and matted for extended use. Rigid construction removes and traps dirt and moisture below shoe level. Fast-dry polypropylene fibers prevent rotting and fading. Available with flat or gripper backing. 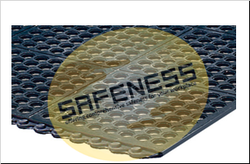 WeldSafe® welding floor mats are designed to repel sparks & metal shards. They are made up of fabric which is flame resistant. WeldSafeÂ® floor mats have a natural rubber sponge base that offers comfort and support during strenuous shifts for safe, ergonomic use in spot-welding applications. Comfort Flow HD Linkable Anti-Fatigue Mats are designed to easily drain and clean. The mat is covered with a lifetime anti-microbial treatment that prevents odours and degradation of the mat. 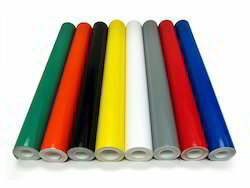 It is made from 1/2" thick, closed-cell Nitrile rubber cushion that is static-dissipative and chemical-proof. 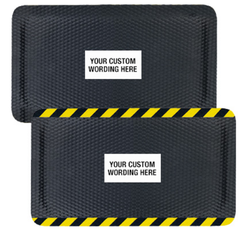 Anti-fatigue mats are safe for use in welding areas and are completely grease and oil proof. Features bevelled edge that provides safe transition from mat to the floor. Anti-fatigue mats are certified slip-resistant by the National Floor Safety Institute to protect your workers from slips and falls. 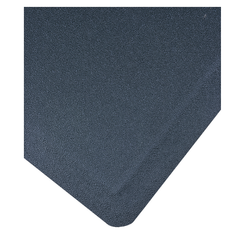 Durable Comfort Scrape Mats are best suited for dry areas with its 1/2" thick closed-cell Nitrile rubber cushion material and beveled edges that provide a comfortable transition from mat to floor. these mats are completely chemical-resistant, static-dissipative, and grease and oil proof. Features a lifetime anti-microbial treatment to make sure your scraper mats don't smell and degrade from use. Zip-Lock Hanging Document Holder is used to protect the documents from the tough weather conditions. Weather-proof zip-lock closure holders seal your vital information for protection under any conditions. These holders are made of 10-gauge vinyl. Looking for Warehouse Storage Products And Mats ?